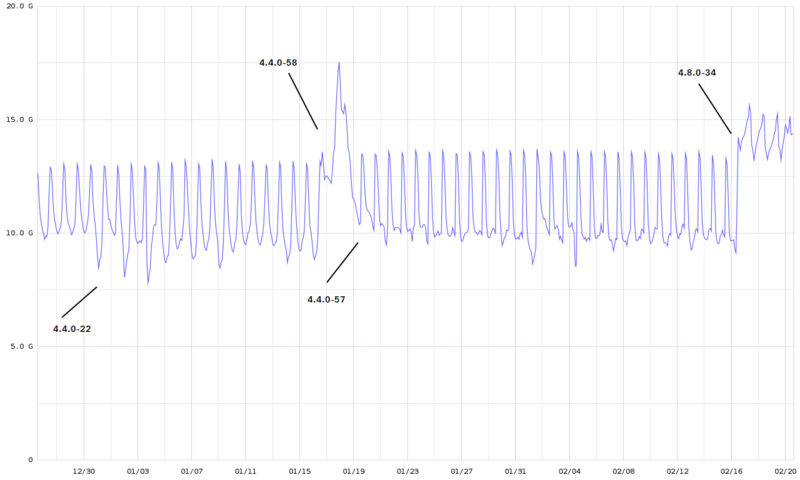 After a fix for LP#1647400, a bug that caused freezes under some workloads, some users noticed regular OOMs. Those regular OOMs were reported under this bug, and fixed after some releases. Some of the affected kernels are documented below. In order to check your particular kernel, read its changelog and lookup for 1655842 and 1647400. If it has the fix for 1647400, but not the fix for 1655842, then it's affected. It's still possible that you notice regressions compared to kernels that didn't have the fixes for any of the bugs. However, reverting all fixes would cause the freeze bug to come back. So, it's not a possible solution moving forward. If you see any regressions, in the form of OOMs, mainly, please report a new bug. Different workloads may require different solutions, and it's possible that further fixes are needed, be them upstream or not. The best way to get such fixes applied is reporting that under a new bug, one that can be verified, so being able to reproduce the bug makes it possible to verify the fixes really fix the identified bug. linux 4.4.0-58, 4.4.0-59, 4.4.0-60, 4.4.0-61, 4.4.0-62. To reiterate, if you find an OOM with an affected kernel, please upgrade. If you find an OOM with a non-affected kernel, please report a new bug. We want to investigate it and fix it. I recently replaced some Xenial servers, and started experiencing "Out of memory" problems with the default kernel. We bake Amazon AMIs based on an official Ubuntu-provided image (ami-e6b58e85, in ap-southeast-2, from https://cloud-images.ubuntu.com/locator/ec2/). Previous versions of our AMI included "4.4.0-57-generic", but the latest version picked up "4.4.0-59-generic" as part of a "dist-upgrade". [ 130.113411] cloud-init: Cloud-init v. 0.7.8 running 'modules:final' at Wed, 11 Jan 2017 22:07:53 +0000. Up 29.28 seconds. I have a hunch that this may be related to the fix for https://bugs.launchpad.net/ubuntu/+source/linux/+bug/1647400, introduced in linux (4.4.0-58.79). you could also try cherry-picking https://git.kernel.org/cgit/linux/kernel/git/stable/linux-stable.git/commit/?id=6b4e3181d7bd5ca5ab6f45929e4a5ffa7ab4ab7f , but that will probably need some more inbetween patches as well..
@f-gruenbichler: I already tried to cherry-pick that patch a while ago and it doesn't work because that patch is based on work that isn't in the 4.4. * kernel branch, not even including Canonical's backports from later branches. Thanks jsalisbury. We have deployed using your test kernel (from http://kernel.ubuntu.com/~jsalisbury/lp1655842/), and experienced no OOM issues. I manage a set of build servers for CPU/IO intensive builds using Yocto/OpenEmbedded. Ubuntu 14.04.5 with the 4.4 Xenial kernel. After updating to 4.4.0-59 the builds started failing because of the OOM killer. Rolling back to 4.4.0-57 fixed the OOMs for me. Can you try the kernel at , which includes the patches that are also at ? Just a note that Joe's armhf kernel has been working well for me. I can't test cascardo's kernel as it's not built for armhf. I will upload armhf binaries for those kernels and let you know. It's important to try those because they include an alternative solution that we would rather use instead of the one with the reverted patches. Using Cascardo's kernel fixes the problem for me. It was a bit of a hassle to install though because there's no linux-headers-4.4.0-62_4.4.0-62.83_all.deb at the link and linux-headers-generic depends on it. I've had a few armhf systems running cascardo's kernel and so far no sign of the OOM or any other problem with it. Cascardo: we've tried your test kernel, and it looks good - we've seen no OOM problems. the xenial machines running 4.4.0-59-generic which is strange. Could someone tell how to implement Cascardo kernel without completely messing up my machine. Please can this be fixed as soon as possible with a release of the next kernel update. Its killing processes such as firefox and virtualbox for no good reason while only 4gb is in use really. Hope this can be fixed soon. its becoming worse as time passes. The patchset for bug "LP #1655842" has been submitted on Jan 24th 2017 and acked by the kernel team on the same day. 30-Jan - 04-Feb Kernel prep week. 05-Feb - 17-Feb Bug verification & Regression testing..
 - "Xenial PATCH 00/11] Fixes OOM for LP #1655842"
 - "ACK: [Xenial PATCH 00/11] Fixes OOM for LP #1655842"
 - "APPLIED: [Xenial PATCH 00/11] Fixes OOM for LP #1655842"
@slashd It sounds really strange to me that I should wait til 20-Feb for a fix for this bug while this is clearly a regression introduced with the latest kernel upgrade. Is there no way to speed things up to fix this regression. Currently we had to downgrade all our xenial systems to linux-image-4.4.0-57-generic to avoid this bug. It will takes 3 weeks to land in -updates pocket, but you can expect to have a call for testing a proposed package by EOW. This is a severe bug. It should be treated a high-priority bugfix that cannot wait 3 weeks. Just as a note for newcomers reading this, I can confirm the bug is NOT fixed in the officially released 4.4.0-62.83. This made my machine stable again, at least for the time I needed. This is fixed in 4.4.0-63.84, which will be available in proposed soon. @nate Thank you! You just saved me a lot of hassle as I was about to unpin the 4.4.0-57 kernel and update a bunch of machines on the assumption the fix was in that version. As a note: I believe this also affects the armhf kernel 4.4.0-1040-raspi2 for the Raspberry Pi. I've been struggling with this bug for nearly a week and only now found this issue. Thanks for fixing it! For the sake of others finding it, here's the stack trace part of the oom-killer log, which contains some terms I searched for a while ago that aren't mentioned here yet. When this new kernel will be released? This bug is killing our MySQL Servers. Booting old kernels is only a bad workaround. I think a lot of people with busy servers will have a problem. Is LTS-Ubuntu still right system for servers? This bug also appears to affect linux-image-4.8.0-34-generic in 16.04.1 Xenial. linux-image-4.8.0-34-generic should not be affected by this. If you see unexpected OOM problems, please open a new bug report and attach the kernel logs, please. Just by the way - 4.4.0-62-generic has the exact same problem. Even when uninstalling 4.4.0-59-generic, my system at some point auto-updated to 4.4.0-62-generic . Only 4.4.0-57-generic is safe for now. LTS Ubuntu with -updates shouldn't have this sort of issue - this is, frankly, unforgivable. We need a new kernel urgently in -updates, and I'd expect serious discussions within the kernel team to understand what has caused this issue and avoid it reoccurring. If this kernel is not going to hit -updates shortly (i.e. days), can something be done to pull or downgrade the broken kernel? At least revert linux-image-generic to depend back on linux-image-4.4.0-57-generic which doesn't have the issues and will stop more people from upgrading to a broken kernel. Having this sort of break in an LTS kernel is not inspiring at all. $ apt-get changelog linux-image-4.4.0-63-generic | egrep "1655842"
Who is the saver 4.4.0-57-generic or 4.4.0-63-generic now. kulwinder singh: Either one, but nothing in between. -57 will reintroduce a few (unrelated) security bugs as well as the bug https://bugs.launchpad.net/ubuntu/+source/linux/+bug/1647400 whose fix caused this one, but is easier to enable and has been tested for longer. -63 should fix this bug, the older bug, and the intermediary security bugs, but requires you to enable the "proposed" repository, and hasn't been tested for quite as long. Anything in between has this bug. Cascardo: Just to be clear, are you looking for verification from anyone in the world, or from specific kernel testers? @nick-maynard: Why is such a bug unforgivable? You can just boot a previous kernel instead. If you're concerned about availability then don't reboot in the first place unless there's an important security patch. there is no related dmesg output after the incident (just some lines from apt-daily.timer). We have been seeing this issue recently as well. We are running 4.4.0-66-generic #87-Ubuntu - I can attempt to downgrade to 4.4.0-57 but its a large cluster with a lot of data so it may take some time. Attached a kern.log from this most recent oom. Under these circumstances, the kernel's oom-killer will kill Wifi processes (rtl_rpcd), systemd-udevd, our Ethereum client (geth), and other critical processes in attempt to stay afloat rather than using reclaimable RAM. I was using 4.4.0-21 as reported by `uname -r` which is default in Kubuntu 16.04. The same bug appears on mainline kernel 4.10 too! I have 4.4.0-59 till 4.4.0-71 and 4.8.0-41 till 4.8.0-46 installed on my system and all are affected by this bug. Firefox, Chrome and Netbeans regularly get killed without a warning and for no reason (since I have something like 10GB+ RAM and all 16GB Swap free at the time the process gets killed). Even KDE has been killed a couple of times while the system still had over 6GB RAM and 16GB Swap free. Yesterday, after the umpteenth time Netbeans was killed while I was in the middle of doing something, I finally decided to do something about this problem and installed Kernel 4.10.9-041009 from http://kernel.ubuntu.com/~kernel-ppa/mainline/v4.10.9/. Sadly, that doesn't seem to resolve the problem either and Oom Killer is still overeager to kill user processes (Firefox and Netbeans have both been killed multiple times). At least KDE hasn't been killed so far. Yes, 4.4.0.63 solved our OOM issues (and we had plenty after 4.4.0.59). Ours were all headless server (bare metal and VMs) related though - no desktop usage. But I never experienced this issue with my home laptop either, but that had lots of RAM and was only lightly used during that period - not really a good data point. I also haven't personally encountered any further OOM issues on my home desktop (used daily) with 4.4.0.63. I'd like to emphasise that the OOM problem only happens with KDE. I have several DE installed including Unity, GNOME3, Cinnamon. But none of them caused a OOM, at least I never noticed. But in KDE, most of the time when chrome is opened, it triggers OOM. dmesg tells that, sometimes kwin_x11 invoked the OOM or plasmashell. Most of the time plasmashell is crashed and the opened tab in chrome is killed. However, chrome application will be there. I need to start plasmashell by pressing Alt-F2 bringing the run command dialog and type plasmashell there. Last night, Even firefox gave an OOM. I'm attaching a dmesg log hoping that will be helpful. This is still an issue in the current linux-raspi2 version. Where those changes ported to that kernel? linux-raspi2 version 4.4.0.1055.56 that is. I'm seeing oom-killer being invoked despite having 2GB free swap when using the kernel from linux-image-4.4.0-1055-raspi2 version 4.4.0-1055.62. Also observed with 4.4.0-1054-raspi2. I'm now back on 4.4.0-1038-raspi2. I think that one was ok.
We're still having issues with higher-order allocations failing and triggering an OOM kill for unexplainable reasons. (on 4.4.0-78-generic). I've attached the relevant OOM killer logs. It may be relevant to note that the server these logs are from is an Elasticsearch instance with a large (~32GB) mlock'ed heap. @nicholas-hatch - what file system are your disks formatted as? I was able to stop the OOM's on my ES hosts by moving from XFS to EXT4. My belief is that there was a memory fragmentation issue with ES and many small files on XFS formatted volumes. The bug is still confirmed and not fixed for linux-raspi2 (Ubuntu), 5 months after getting fixed for the main Ubuntu. Shouldn't this have some priority? Even apt upgrade breaks if I don't use the clear cache workaround. I can live with it (cron job to clear cache) but this is not great for LTS. Chris, can you test if this kernel solves your problem? I undid the workaround, installed and booted the kernel and will test it for a few days. I'll keep you posted on results. Update: No sign of Out-of-memory errors or kills, after 3 days of testing the 4.4.0-1062-raspi2 kernel. I'll report back again next week. 4.4.0-1062-raspi2 is looking good - I've had it running for a week without oom-killer being invoked. Mine's also still stable (no OOMs), after running the patched kernel for 9 days, on a Raspberry pi 2 Model B v1.1. I am experiencing at one of our compute node hypervisor. kernel version we are using is 4.4.0-83, but seems to be having the issue reported in this report. We are also experiencing this issue running linux-aws 4.4.0-1028.37, which tracks Ubuntu kernel 4.4.0-89.112. Our use case is very similar to comment #86 (https://bugs.launchpad.net/ubuntu/+source/linux/+bug/1655842/comments/86). In our case ElasticSearch 2.4.5 is running under Java 1.8.0_131 with a ~29GB heap; we downsized from 31GB as a troubleshooting effort with no change to the frequency of OOM. The issue also occurs regardless of vm.overcommit_memory being set to 0, 1 or 2. The relevant data from kern.log (with redacted hostname) is attached; I'm happy to provide additional logs or test different kernels, but since our use case is i3-class instances in AWS, we need the nvme enhancements and enhanced network I/O provided by the linux-aws package. Please, do not cut the logs. Without the "invoked oom-killer" line, for example, it's hard to see the gfp flags and allocation order that failed. I have seemingly solved this issue with linux-aws version 4.4.0-1016-aws at the very least. The specific issue I was seeing was 2nd order allocations failing when OOMKiller triggered. At the time I was thinking the issue was due to XFS and memory fragmentation with lots and lots of memory mapped files in Elasticsearch/Lucene. When we moved to EXT4 the rate of oomkiller firing dropped, but did not stop. We made the following 2 changes to sysctls which have effectively stopped higher order memory allocaitons from failing and oomkiller firing. Also these settings were used on i3.2xlarge hosts that have 60G of ram - your milage may vary. Also we do not run swap on our servers, so likely adding swap could have helped, but not an option for us. vm.min_free_kbytes = 1000000 # We set this to leave about 1G of ram available for the kernel in the hope that even if the memory was heavily fragmented there might still be enough memory for linux to grab a higher order memory allocation fast enough before oomkiller does things. Apologies - the file was inadvertently split by logrotate. I have concatenated the entire contents of kern.log and kern.log.1 into the attached file; these are the only kern.log files in /var/log on the system. I do have to redact the hostname in question, but it is a simple substitution of 'localhost' for the FQDN of the system. We have another case of OOM at one of the host that we upgraded kernel to 4.4.0-89 a week ago. With the sysctl settings provided by Pete (vm.min_free_kbytes = 1000000 and vm.zone_reclaim_mode = 1), we've been running the linux-aws 4.4.0-1028.37 kernel successfully without an OOM killer invocation for about four days now. Previously we would have seen three or more occurrences of this per day, so it's a positive indication. We have found this issue on 4.4.0-92 too. But only when the systems were put under stress. Reverting back to 4.4.0-57 resolved it. Not sure if it's the same issue, but we had an unexpected OOM with Ubuntu 16.04.3 LTS, 4.4.0-91. We believe that we are experiencing this issue on kernel 4.4.0-1030-aws as well. We recently move from 14 LTS to 16LTS and are now experience oom kills. Side Question... Is there something I can specifically look for on a Ubuntu install that would indicate if that kernel has the fix or not. I assume the "Fix or Not" indicates are manually triggered and the fix could be out for AWS but not indicated. In our production environment of ~1800 nodes we've seen oom-kill events that looked similar to this bug's pattern - oom-kills killing large server processes while resident memory was far lower than available physical memory. We were affected by the original bug and saw that issue readily addressed in newer kernel versions, as mentioned in the earlier comments in this ticket. However, we still kept seeing oom-kill events, albeit in far lower numbers over time, that were happening on kernel-upgraded systems. These were a mystery for awhile, largely due to their infrequent occurrence. After a lot of research we think we've pinned it down to a subset of our multi-socket servers that have >1 NUMA memory pools. After implementing some scripts to track NUMA stats we've observed that one of the two NUMA pools is being fully utilized while the other has large amounts of memory to spare (often 90-95%) Either our server app, the JVM its running on, or the kernel itself isn't handling the NUMA memory pooling well and we're ending up exhausting an entire NUMA pool. Work is ongoing to see the causality chain that's leading to this. We don't yet have confirmation about whether its something our app (or its libraries) is doing, if we just need to make the JVM NUMA-aware with args, or if there's kernel tuning to be done. But I did want to mention it here as a warning to folks running on multi-NUMA-pool multi-socket systems seeing similar behavior. You can potentially use numactl to launch the process and set a policy of interleaving allocations between NUMA nodes to avoid these 1 sided allocations. Tends to happen with servers that make big allocations from a single thread during startup, as commonly seen on mysqld servers and the innodb_buffer_pool for example.